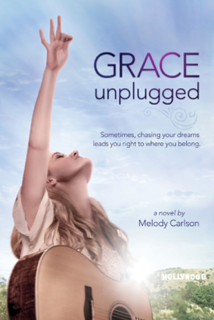 I haven't had the chance to read fiction much lately, but the story line of Grace Unplugged by Melody Carlson caught my attention. Melody Carlson has sold more than five million books. A professional writer for twenty years, she recently received the Romantic Times Career Achievement Award. Melody has two grown sons and lives with her husband in the Pacific Northwest. My own daughter was very interested in the entertainment industry at one time. Knowing the culture surrounding such a career, her dreams of Broadway or the big screen always made me a little nervous. Though she has now redirected her career goals, the fact is, no matter what our kids will be doing in the "real world", their faith will be put to the test. Though an entertaining and thought-provoking story for all ages, Grace Unplugged would be a great novel for a teen girls. Some of the themes (drinking by the main character, for example) may not be desirable for younger kids. I hope to be able to see the movie, releasing October 4th. See the trailer below. The novel Grace Unplugged, released early this month, is 304 pages and $15.99. 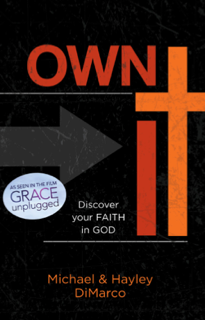 In the Grace Unplugged, Gracie Trey is introduced to an actual non-fiction book, Own It by Michael and Hayley DiMarco. The book is described as "life-changing". Michael DiMarco is a skillled communicator and teacher who has authored more than a dozen bestselling books including the 2010 Christian Bookof the Year for Youth, B4UD8 (Before You Date). He and his wife, author Hayley DiMarco, have one daughter and live in Nashville, Tennessee. This would have been a great book for me to read as an older teen heading off to college, where my faith met many challenges. With teens in the house, much of what this book discusses has been recent conversation in our home and very relevant. I don't want my kids blindly following the faith with which they've grown up. I want them to make it their own, fully grasping and living it out. This is a title I will be having both of my teens read in the very near future. Own It is 192 pages and available for $14.99. One lucky reader will have the pleasure of winning a copy of both titles! Please see below for details on how to enter. I was given a copy of this product in exchange for my honest review. The other day I was watching my son whip out a paragraph and his laptop. I am so grateful that he's become a proficient typist. Though he hasn't been officially diagnosed as dysgraphic, one look at his writing and a diagnosis isn't really necessary. This is a kid who is much better off typing and school work has been much easier since he's mastered this school. We struggled at first in finding the right program, but two years ago I discovered Keyboard Classroom. Below is my review at that time. I also have a bonus for my readers! As a celebration of the successful typist I now have, I would also like to host a giveaway. One lucky reader will win a Dual User License, a $75 value. I remember when I learned to type in high school, hunched over a typewriter with an instructor chanting keystrokes. It wasn’t exactly thrilling, but I now say it was the most useful skill I learned in high school. Hardly anyone waits until high school to learn typing any more. It is too much of a necessary skill now to wait that long. My daughter learned at age 8 with a popular software program. I intended to use the same program for my son, but it just didn’t take off with him. After another software failure, I switched over to the old flip book style that reminded me more of how I learned to type. Unfortunately, it wasn't as successful as I had hoped. I especially wanted him to learn to type early because writing is difficult and tiring for him. However, while he can now type at 12, he just isn't as functional as I think he needs to be at this point. While all of the programs we tried were somewhat successful, none were the best program for him. The software programs seemed to either have too many distracting games, or weren’t systematic enough. The flip-books were very systematic, but didn’t have any motivation tools and also required constant supervision from me. The end result was that my son could type, just not with the needed speed to get maximum benefit. He was pretty good about knowing the location of the keys, but his hands still floated around the keyboard, creating errors. As a 7th grader with increasing writing requirements, he really needs to be a more proficient typist. When I was presented with the opportunity to review Keyboard Classroom, I was exited to see how it might work in our homeschool. Keyboard Classroom, which was developed over 20 years of research, is based on a timed fluency approach. The program takes a systematic approach, building muscle memory toward mastery. There are five fluency levels: Finger Trainer, Typing Words, Home Stretch, Typing Sentences, and Capital Stretch. Each fluency is based on a 1-minute time limit. With passing levels closely monitored by the program and gradually increasing difficulty of skill levels, mastery is more easily achieved and ensured. As the student progresses through the program, tokens are earned to play games. The users also increase in rank (Cadet – General) as they move up in levels, which gives the student a big picture of their progress. A unique feature of this program is the finger guides that are affixed to your keyboard. They are attached with Velcro, allowing you to remove them when desired. I was anxious to give the guides a try, since wandering hands were slowing down my son’s progress. The video below explains more about the program and allows you to see it in action. We all know that something can look great, until we try to implement it into our homeschool. I’m happy to say that we’ve had a lot of success Keyboard Classroom. It seems to have all the features we need that other programs we tried didn’t. For starters, the finger guides immediately solved my son’s problem of his hands floating around keyboard and improved his accuracy and timing by not having to constantly look down at his hands. While there are fun games in the program, the games are being used as reward and reinforcement, not the method of instruction. We’ve tried too many programs where either a focus on games was too distracting or the program was so dry by not having any games that it wasn’t motivating. Keyboard Classroom seems to hit the right balance of having students learn through systematic repetition, while earning tokens to play games. For my distractible son, the 1-minute fluency exercises were perfect. The short exercises gave immediate feedback and clear goals (master 6 times before moving to the next level). The ranking system helped him see his overall progress so far, which is motivation to keep continuing. Earning tokens to play the games was also motivating, without the games becoming the primary focus. There are a couple of things which you need to be made of aware before purchasing. The software can be purchased with a license of 1, 2, 3, 5, or 25. So, if you have more than one student needing to learn to type at the same time, make sure you buy accordingly. However, if you want to use the program for one student, then save the software to use with another child later, that is possible with licensing for just one. Just be aware that once you remove and add a username, that all work for the previous user will be lost. You should also be aware that in order to play the games, an internet connection is needed. The basic program will still run without internet, though. Keyboard Classroom was designed with the student with learning differences in mind, but the methods used would be a benefit to any child learning to type. I’ve had my son practice his typing for 15-minutes a day and have been pleased with the results. While he has learned to type some over the course of everything we've tried previously, I think Keyboard Classroom has the repetition, independence, and motivation to finally get him where he really needs to be. It is definitely a program that we’ll continue to use. Keyboard Classroom sells for $39.95 for a single license. Please visit the Keyboard Classroom website to learn more about the software or to make a purchase. One of the things people often ask when they find out I’m homeschooling high schoolers is how I am able to teach them the all of the various subjects at their level. My answer is usually a simple – I don’t. At least, not always. While I’d like to believe I’ve learned enough over the years that I could satisfactorily teach them just about any subject, I really am aiming higher for our homeschool. I want them to learn from experts, or at the very least, discover how to seek knowledge and learn independently. Even so, while I am not an expert across all subjects, I do have an education and can help them in many areas. I guide, explain, teach, oversee and pretty much supplement whatever resources we are using in most subjects. Fortunately, my academic strengths match my oldest daughter’s academic strengths for the most part, though I’ve shared in the past my clueless subject is Latin. In this case, I just have to completely outsource. Understandably, I just can’t wing a foreign language where I have zero experience. I’m ok with that. We all have our deficiencies. However, my son has discovered a new deficiency of mine – computer programming. I’m going to date myself a bit here, but when I was in junior high, my school started offering the latest and greatest in computer courses. It was a big thrill to learn how to scroll my name across the black screen in bright, green letters. No cool graphics, no Windows, not even a mouse to operate. And that is pretty much the extent of my computer programming experience. Computer programming is clearly something I need to completely outsource if my son wants to learn it properly. I need a program directed to the student with clear instructions. The content needs to be of enough substance to justify a solid high school credit, but not something designed for professional adults or overly technical. My student needs to be able to complete it independently, but it also needds sufficient support materials clear enough for a teacher who really knew nothing about the subject. Hands-on projects would be ideal, not only for the subject, but for my son’s learning style. Speaking of learning styles, video instruction would be awesome as well. It sounds like a bit of a tall order, doesn’t it? It was, yet a program with all of the above fell into my lap. I recently had the opportunity to review Homeschool Programming’s TeenCoder C# curriculum. I had heard of it before, but really didn’t give it much thought as we didn’t have a need for such curriculum at the time. However, a course in computer programming was something I really thought would be beneficial for my son’s high school transcript given his interest, and he's now entering 9th grade. TeenCoder C# is a high school curriculum using Microsoft’s free Visual C# program. It is broken down into two semester programs: Windows Programming and Game Programming. You can purchase them together for one full high school credit or as individual semester courses. Windows Programming is a prerequisite to Game Programming. I received a digital version of all the materials for reviewing purposes, but those ordering would receive a perfect-bound 8.5” x 11” student book and a course CD. I also was able to view the supplemental instructional videos for each course, which would be received on a DVD if purchased. Windows Programming is presented in 17 chapters, with each chapter having three to four lessons each. Each chapter also has a hands-on activity. The average weekly time required is about 3-4 hours. The student text is written directly to the student; my son (14) said the instructions were very clear and easy to follow. Check out the Sample Student Lesson to get a feel for the presentation. The activities start pretty basic and progress in difficulty throughout the program. By the second chapter they are writing and running their own C# programs. In the last chapter, students create a chess game. For a look at the material covered through the course, see the TeenCoder Windows Programming TOC. Getting started was initially a bit frustrating, but I think that was mostly because I had a digital version of the text and downloading the required Visual #C program wasn’t as straight-forward as I would have liked. Everything was easy to follow after the initial process. There are also instructions on the website to help with the download process. While everything is geared directly to the student, the teacher (inept or not) isn’t left hanging. Support resources include a solution guide with short chapter summaries, explanations of student activities, tests and answers, and help files. View the Solutions Overview and Sample Activity Solution to get a feel for the structure of the teacher materials. It is assumed that you, as the parent, do not know how to program. This was a must for me! Homeschool Programming also emphasizes that they are available for questions for the lifetime of the course. If you have an audio visual learner as I do, instructional videos are available as an optional resource. The student textbook is required to complete the course, but the instructional videos are reinforcement of what is covered in the text. I had my son watch them first so he knew what to expect, then I had him read the chapter. Sample instructional videos are available on the Homeschool Programming website for the various programs offered, including a Game Coder Sample Instructional Video, which is part of the second half of the TeenCoder C# series. The second half, Game Programming, is structured identically to Windows Programming. Students learn a game-creation framework for Windows and X Box 360 using Microsoft’s free XNA Game Studio. We didn’t get to this portion of the program because Windows Programming needs to be completed first, but trust me when I tell you my son is looking forward to going through the material. In the final project, students create a bumper car game. For the complete content covered, see the TeenCoder Game Programming TOC. Both my son and I had a great overall impression of TeenCoder C#. My son was able to work through the material completely on his own. He said the manual was very clear and well-written. So far, I haven’t even needed to use the teacher helps, though I did look them over and found them simple enough.Visual C# is easy to use and is drag-and-drop. TeenCoder C# gets very high marks from this family for ease of use! My son really appreciated the instructional videos. In fact, I think he really wished they were a larger part of the program as he really got a lot out of seeing the activity instructions rather than reading about them. I highly recommend you add them to your package as they are well worth it. If you are looking to include computer programming in your homeschool learning, I highly recommend you check out Homeschool Programming. They have a variety of resources, including the KidCoder series for younger students. TeenCoder C# can be purchased as two semester courses or as one-year package. Either Windows Programming or Game Programming is $75 for the course only or $90 for the course and videos. If you start with the course only and decide later to purchase the videos, they are available for $20. A nice discount is provided if you purchase both semesters at the same time. Package pricing is $130 for courses only, $155 for courses and videos, and $30 for the videos only. Visit the Homeschool Programming website to learn more or to purchase. To read more reviews on TeenCoder and other products from Homeschool Programming, visit Mosaic Reviews.